Former Defense Minister Moshe Ya'alon (Likud) spoke on Saturday evening about Elor Azariya's conviction. "Politicians are brainwashing the public to blame IDF Chief of Staff Gadi Eizenkot and myself," Ya'alon said. 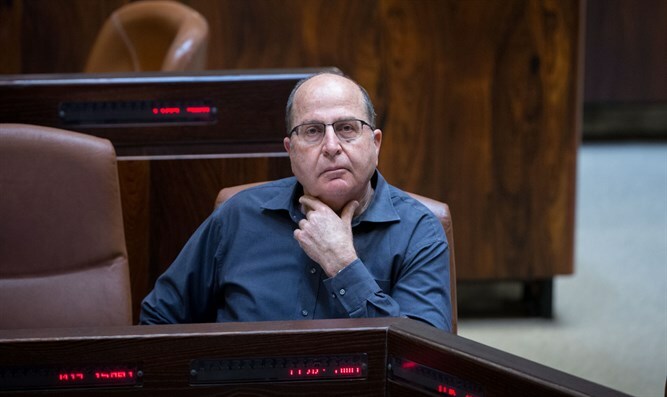 Ya'alon was forced to step down from his position as Defense Minister after he unjustly expelled Hevron residents from their homes and compared Azariya to ISIS. "My heart is with the Azariya family, and with Elor," Ya'alon told Channel 2. "I did not decide Azariya's fate." Ya'alon said Azariya's case was decided even before footage from the Hevron terror attack became public, and that the government was forced to declare an investigation to prevent the media from publicizing the matter further. He also said the only time he interfered was to ask if Azariya had to wear handcuffs, or if it was possible to remove them. However, Ya'alon did not mention pardoning Azariya. "This isn't the place to discuss it, and there are rules," he said. He also addressed the Azariya family, saying, "They've brainwashed you politically, and they're telling you lies. Don't appeal the verdict, it's a waste of your time and it will cost you your health. Elor needs to admit he made a mistake, express regret for his actions, and then they'll be considerate [when sentencing him]."